With U.S. stocks at all-time highs, folks are wondering where prices can go from here. After all, U.S. growth is still anemic, the Federal Reserve is rolling back its market assistance and corporate profits aren’t all they could be. Granted, there will be periodic corrections and unpleasant events that will “shock” the markets into temporary downturns. Much of it will be fueled by technology investments and innovation. Today I’m going to show you the five catalysts that I believe will fuel this dramatic run. And I’m also going to show you how to go along for the ride. But if there’s one lesson you should take away from today’s discussion, it’s this: In a generational bull market like this one, you should always have money at work in the market. 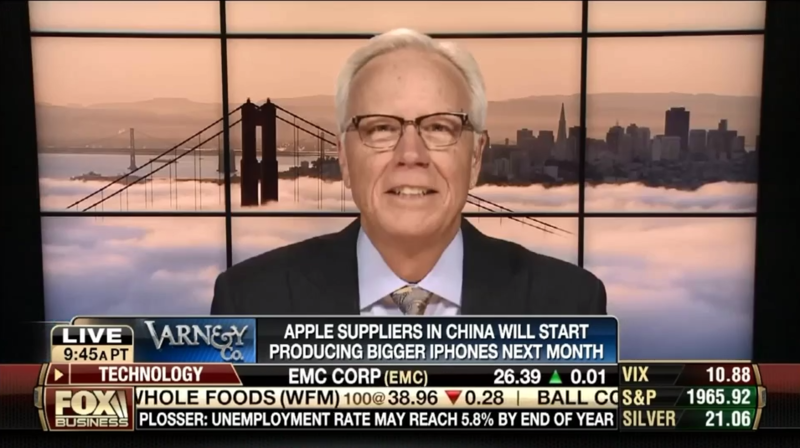 Yesterday, Michael appeared on Fox Business’ Varney & Co. to talk Apple Inc. (Nasdaq: AAPL). Suppliers in China are set to start producing iPhones with bigger screens in July. Prior to 2011, all iPhones had a 3.5-inch screen. Then, Apple launched the iPhone 5 and 5s, which sported 4-inch displays. But the newest offerings are reported to have 4.7-inch and 5.5-inch screens. Watch the video to see how high Michael predicts Apple stock will climb from the larger iPhone display offering. It’s easy to ignore the wallflower. I’ve done it numerous times at networking events. And I’m sure you’ve done it, too. We get charmed by the charismatic guy or gal who can talk a mile a minute and somehow make the hoariest of buzzwords sound like Zen-level wisdom. And the minute the conversation is over, what we thought was wisdom fades away in an instant. We miss the genius sitting in the corner – the one with a zillion-dollar gadget idea or a new system that will make our widget factories 10 times more efficient. Indeed, it’s happening right now. Wall Street and the mainstream media are doing what they do best by ignoring technology’s most exciting wallflower. In this case, our wallflower isn’t a young but shy whiz kid, but a quiet giant – one that keeps making tons of money year after year … but hardly anyone notices. I’m not going to let you miss out. This wallflower is the heir to an investment fortune. And there’s plenty to go around. But you are going to cash in … and cash in big. I keep track of every stock I recommend to you here in the Strategic Tech Investor. The performance … the track record … you see, is very important to me. For ethical reasons, I can’t invest in these stocks myself, but I’ve got a spread sheet – in the cloud, naturally – and that helps me keep tabs on how well you all are doing. I’ll catch myself grinning when I see that a stock I’ve recommended is making a move. And I’ll often pump my fist in the air when the stock suddenly soars. I’m not easy on myself when it comes to losers, either. Folks around Money Map Press will tell you that I fall into quite a funk when one of my picks rolls over and heads south. And that funk can linger for days when one of my favorites turns turtle. I don’t track my recommendations just to experience these emotional highs and lows. I do it because I want to make sure we’re keeping you all on the road to wealth. I also do it to add to my knowledge base. Even after 30 years as an investor, I still have plenty to learn. As I’ve gathered knowledge over the years, interestingly enough, I’ve become more of a “rules-based” investor. While I love an interesting story – or a hot new gadget that’s powered by the latest technology – I recognize that, in a stock-picking venue, these emotional responses to a stock can disrupt my analysis. So I set up my rules to divert my attention away from such distractions … and focus it on stocks that will create value and make you rich. A lot of other experts in this business have the same goal. But that’s where our philosophies diverge. Those other folks don’t want to share their methods, insights or secrets. That’s why I’ve shared my rules-based systems with you: There’s my “Five Tools to Turn Choppy Markets to Your Advantage,” and, of course, there’s also my foundational five-part strategy for building wealth through tech (here’s Part 1: “The First Rule for Spotting a High-Tech Winner”). Today, I thought I’d check my STI spread sheet and pick one stock that we can use as a kind of “mini-case study.” I’m going to show you how to apply my rules-based “screens” to analyze the stock. And then you’ll be able to use this system yourself – it’s pretty easy. General Motors Co. announced another set of recalls this week that brings the company’s 2014 recall total to 44, covering nearly 18 million vehicles. But amid the continuing recall fiasco, the company’s stock has actually gained 5% in the last three months. So does that make GM stock a “Buy” now? 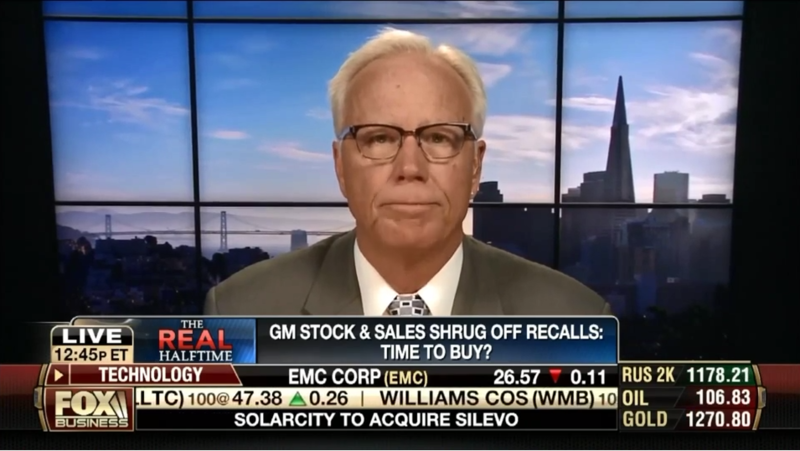 Michael joined FOX Business‘ “Varney & Co.” Tuesday and discussed how he would play GM stock given the recent news and the stock’s performance. To read more and watch the full interview, click here. Somewhat ironically, a rollover in the biotech market was one of the proximate causes of the overall selloff in tech earlier this year. And now I’m recommending that you invest in the company that purportedly “caused” the biotech market to roll over in the first place. That’s because this company will be the biggest beneficiary of biotech’s comeback. Just the other day, I was pondering the decline in PC sales – down 4.4% in the first quarter, compared to last year, according to market researcher IDC. And I assumed, without doing any research, this meant software was also down. With the long-term decline in PC sales, dating back to at least 2012, many investors and the big-money guys on Wall Street are writing off software, too. On the surface, the logic makes sense: If people are buying fewer computers, they’ll need fewer accounting, sales management, and word-processing packages. But that’s a superficial analysis. Turns out that increased sales of commercial software more than makes up for the decline in PC-related software. Today, I’m going to talk to you about one of the single best software investments you can make. With it, you’ll start benefiting from the profits of the entire software industry, from the big dogs to the young and growing. Apple Inc. (NasdaqGS: AAPL) held its annual World Wide Developers Conference last week. 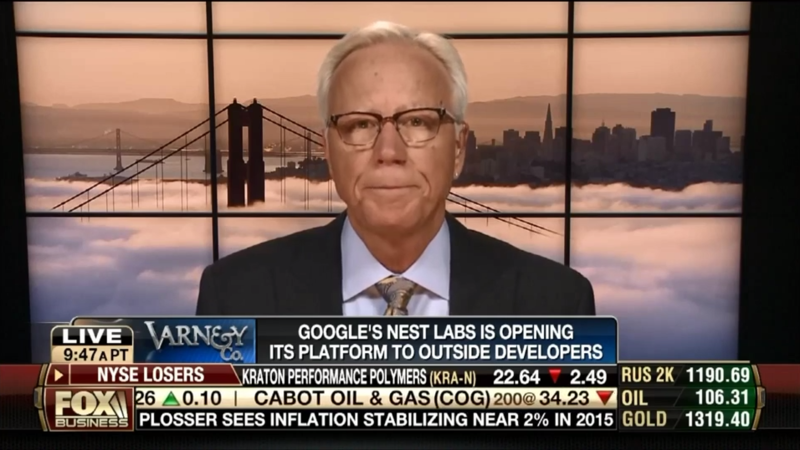 The usually captive tech media was totally underwhelmed. Granted, Apple didn’t introduce a new product at the World Wide Developers Conference. But the way I see it, the Cupertino-based giant did something that was much more important than just roll out some new “gadget.” Apple actually unveiled strategy that puts the company into two new businesses and positions it for years of potential new growth. And that means the stock – which has zoomed back up near its 52-week highs – is headed even higher. Today, I’m going to show you why. And I’m going to start by telling you about a new concept in computing – a term you’ll soon be hearing lots about. By learning about it, you’ll once again be ahead of the big-money pros on Wall Street.